It seems when I start a post I’m usually apologizing for the lack of postings. I’m horribly lazy at times and have a few backlogged things I’ve photographed but never got around to blogging. I get into this zen mode of cooking and at times photographing it, I upload it and place it in its own file, properly named for later reference. What I don’t do is write down to recipe, edit the photos and blog. After awhile I stare at the pictures and decide I should blog it, but can’t remember how I made it. When I cook savory, I rarely use a recipe, I toss in a bit of this, a pinch of that and dash of these and a handful of those. I honestly do try! My laziness just usually wins over, but at least I’m not longer apologizing! 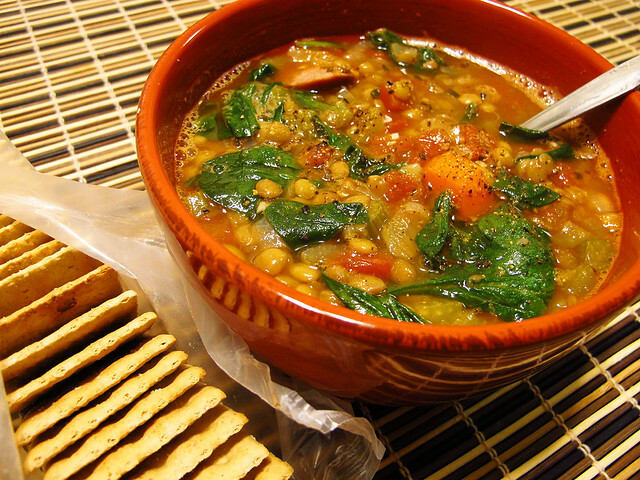 I made this lentil soup on April 3rd for my sister because she was craving soup. I know, April and it’s now August. Better late than never! 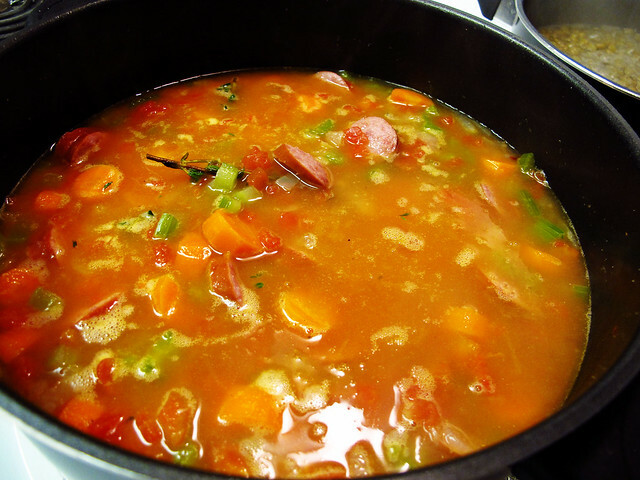 Luckily this soup is so easy to make I can do it in my sleep, plus it’s delicious with loads of vegetables. Serve it with crackers to crumble on top or crusty bread for dipping. YUM! 1. 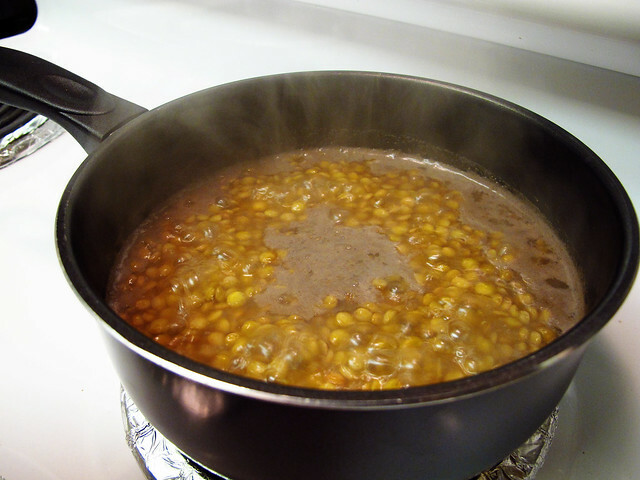 In a small pot over high heat, add lentils and enough water or chicken stock to cover lentils by 1/2 inch. 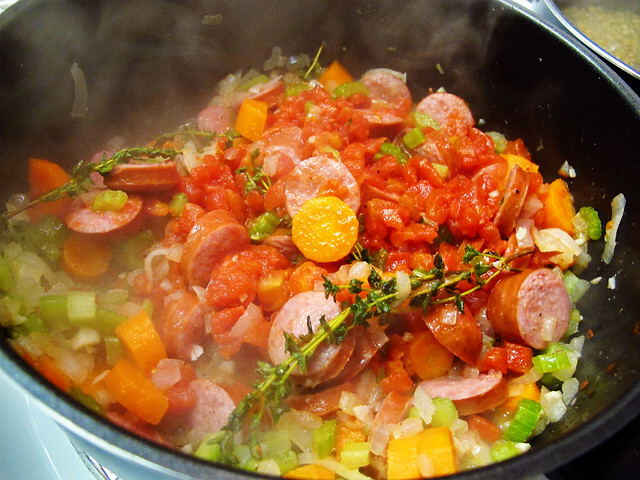 Bring to a boil then turn down to simmer uncovered for 15 mins. Skim off any scum that may rise to the top. 4. Add tomatoes, thyme, bay leaves and cracked black pepper, boiled lentils (including liquid it was cooked in) and enough chicken stock to cover everything by an inch. Bring to a boil then turn heat down to low. Allow to simmer for 20 mins. 5. 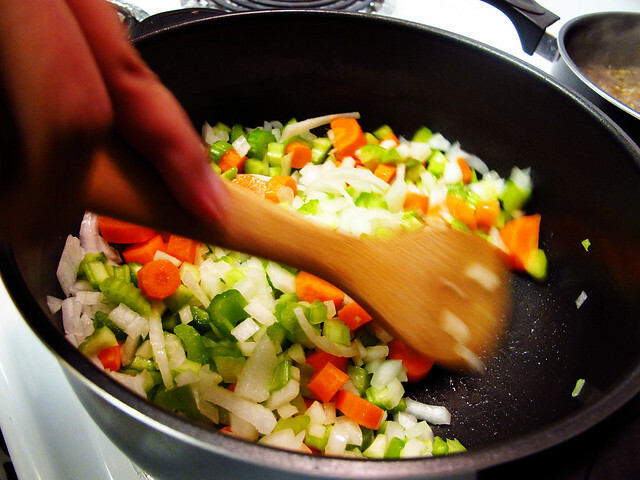 Check seasonings, add salt and pepper to taste. 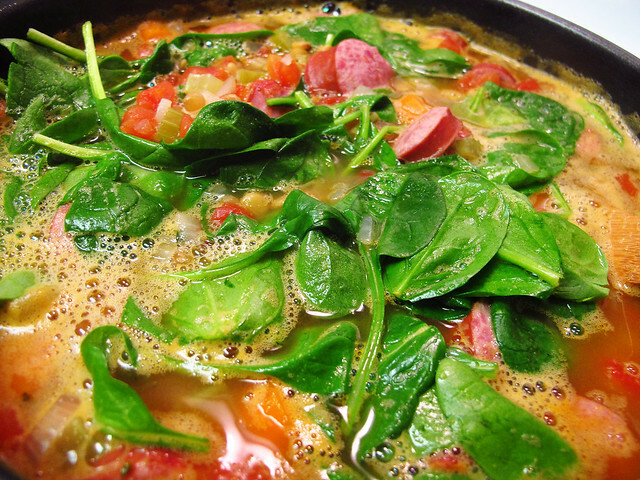 Stir in handfuls of baby spinach, turn off heat. 6. Enjoy a big bowl with crackers on the side! I like to top mine with lots of black pepper and red pepper flakes. 1. 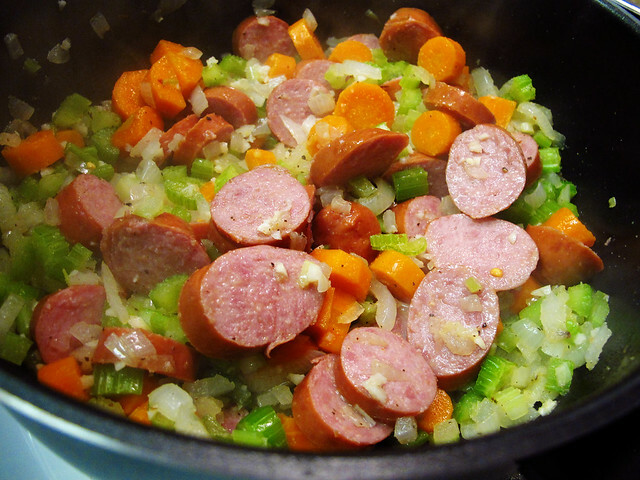 This recipe can be easily converted to a vegan soup, substitute chicken stock for vegetable stock and omit the sausage. 2. I’m a lazy cook, instead of stripping the thyme leaves and chopping them, I just throw in 5-6 sprigs into the soup and fish them out later. The leaves fall off during cooking, easy! Don’t forget to fish out the bay leaves also, no one should be eating that! 3. It tastes even better the next day and freezes beautifully.